Are you heading to Montego Bay in Jamaica? 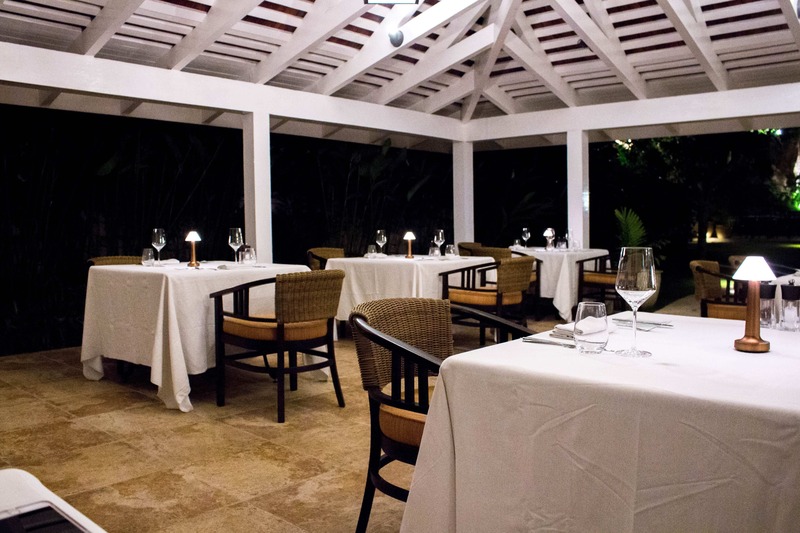 Sugar Mill Restaurant is a must-try if you’re looking for a fine dining experience with exceptional service! Thank you to the Jamaica Tourist Board for hosting our stay in Jamaica. All thoughts and opinions are my own. 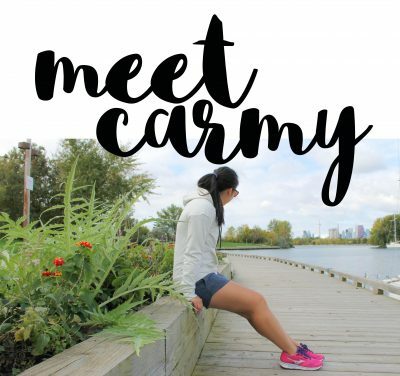 Thank you for supporting the brands that support me! When thinking about Jamaican food, I’m not going to lie, my first thoughts are always beef patties and jerk chicken. I mean, I absolutely love beef patties and I’m always chasing that flavour that I experienced when I had my first beef patty in Jamaica. 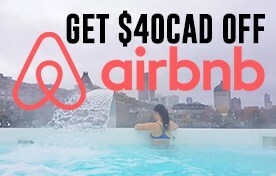 It’s just not the same in Toronto! 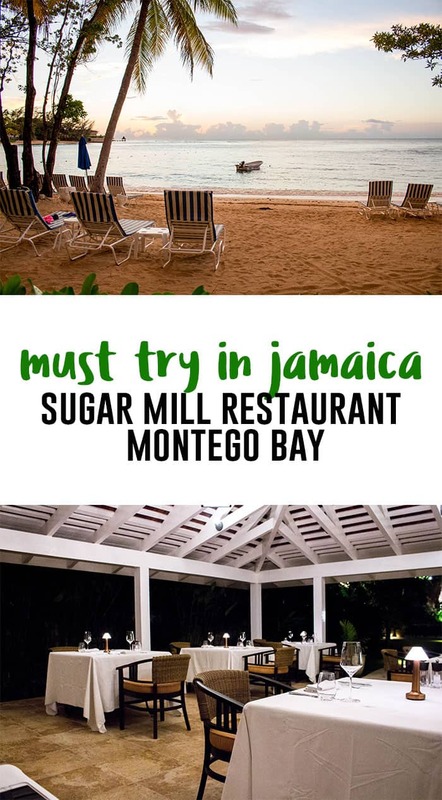 Anyways, back to the original point about food – the first thing I think of is pretty much those two comfort foods but on my most recent trip to Jamaica, I had the chance to dine at the Sugar Mill Restaurant at Half Moon Resorts. The Sugar Mill Restaurant shows the taste of Jamaican cuisine but it has a refined modern day twist. Island flavours are infused into every dishes but elevated. You know how in Master Chef, contestants are always making an elevated version *insert delicious homestyle dishes* such as a deconstructed spring roll and it always turns out gorgeous and delicious? Well, Sugar Mill Restaurants punched it up a notch and went beyond elevated for their dishes. I’m a big fan of locally sourced produce and the Sugar Mill Restaurant uses herbs and spices grown right in their garden in addition to sourcing locally grown and seasonal produce. They literally take farm to table to a whole new meaning with their own garden! The group and I had stopped by for a late dinner on our first night at Half Moon Resort so sadly I do not have any photos of the front of the restaurant since it was quite dark (so excuse my photos for being a bit low lit). When I first walked in, I noticed the scent of citronella oil. If you didn’t know, this plant is known for keeping the mosquitoes away and boy oh boy did I need that. In the 4 days I was in Jamaica, I was bite practically hourly! However, I was not bit a single time sitting in the outdoor (see the photo above) seating area. And did I mention it was at night? So I’m outside eating at night and received zero bites. I’d like to dine here every night if I could! The staff was extremely attentive and even offered us three ladies with black dresses a black napkin instead. There was also a hole in the napkin for the gentlemen to secure their top button to so they wouldn’t have to tuck the napkin into their shirts. Fancy huh? After we had settled into our seats and gotten our drinks, the chef came out to give us a rundown of our evening. They were going to serve us 4 dishes in a smaller portion so we could get a feel of the menu before coming back to see what we’d like for our entrees (spoiler: we were so stuffed from our samplers, we didn’t have any room for an entree!). Also, I’m just going to spoil the rest of the post here for you – the dishes – all ridiculously delicious. I would recommend every single plate! So let’s see what we had! Friends, you know me, you know how I feel about asparagus. You know I immediately place my share onto H’s plate. So you know it’s good if I’ll eat my asparagus. 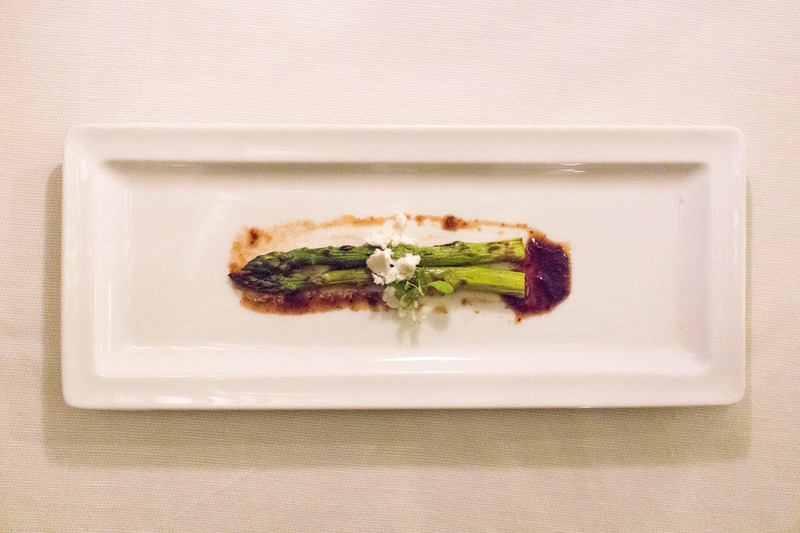 I’m pretty sure this is the dish that’s going to officially change my opinion on asparagus. Who knew that Jamaica was where I fall in love with asparagus. We had a more traditional version of the Jamaican Breakfast on the second day we arrived in Jamaica so it was interesting to see how a fine dining restaurant would make their version stand a part. 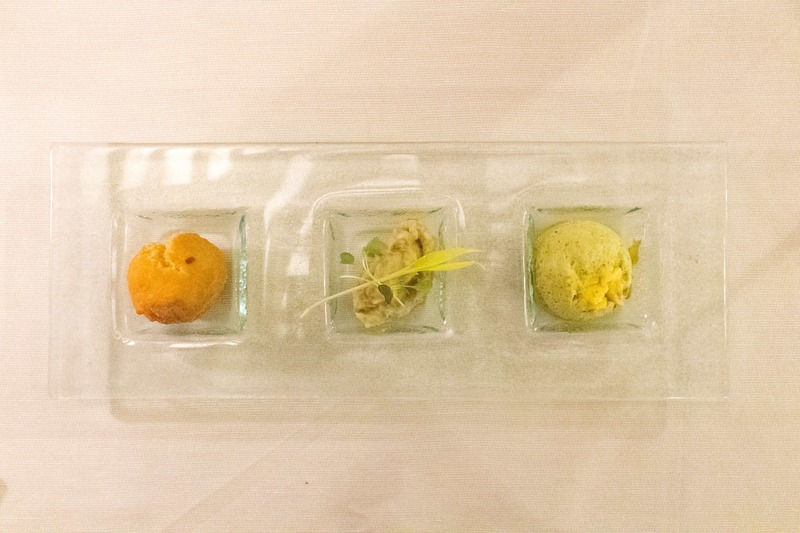 Shown above are the usual components of a Jamaican Breakfast – mini fried dumpling, ackee flan, and sailfish brandade. I’m not sure what they did to it but it definitely tasted different (in a good way!) than the previous version that I had tried. I found that the texture was different and my table mates found that the ackee flan to have a bit more of a kick to it. NOTE: two of our table mates has a shellfish allergy so they got to get the Jerk Chicken Rolls instead and boy was I jealous. Their dish comprised of crispy jerk chicken rolls with cho cho slaw, sorrel, and dark rum chutney. It was such a fun twist to have put the jerk chicken into the spring roll and it was something I’d definitely want a full potion of to myself. 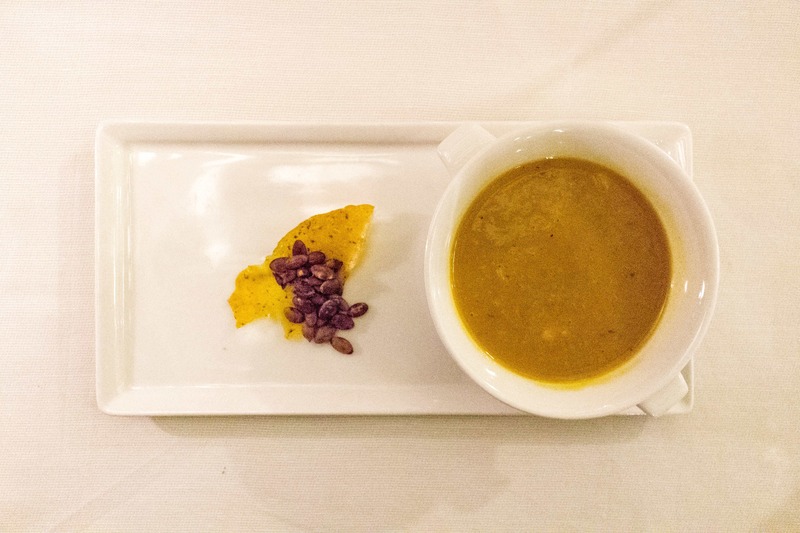 Next we had the smoked pumpkin soup made with pumpkin, squash, and apple with a side of jerk pumpkin seeds and a pumpkin chip. Y’all know I’m a soup girl – if you follow me on Instagram, you’d see in my stories a few weeks ago that despite being 30C out, I got hot soup for lunch. I’m all about enjoying the comforts of a soup. This meant I had high expectations when it came to having a bowl of soup set in front of me. Let’s start off with those jerk pumpkin seeds – I need the recipe or the jerk mix because I need that in my life. Move over regular pumpkin seeds, I want to be snacking on jerk pumpkin seeds instead now. I’ve never had a pumpkin chip because so that was interesting. Then I tried the soup and it went beyond my expectations. The small bits of apple really gives the soup a hint of sweetness. After I combined the seeds, chip, and soup together, that was where the money was. I need to figure out how to make this soup because I need it to be a staple in my household. The sweet potato oxtail ravioli was one of my entree contenders because I didn’t choose the carb life but the carb life chose me. Cutting into the ravioli, if there was a bone in there, the oxtail would have been fall-off-the-bone tender. I’d like to have 100 of these raviolis frozen and shipped to my house. 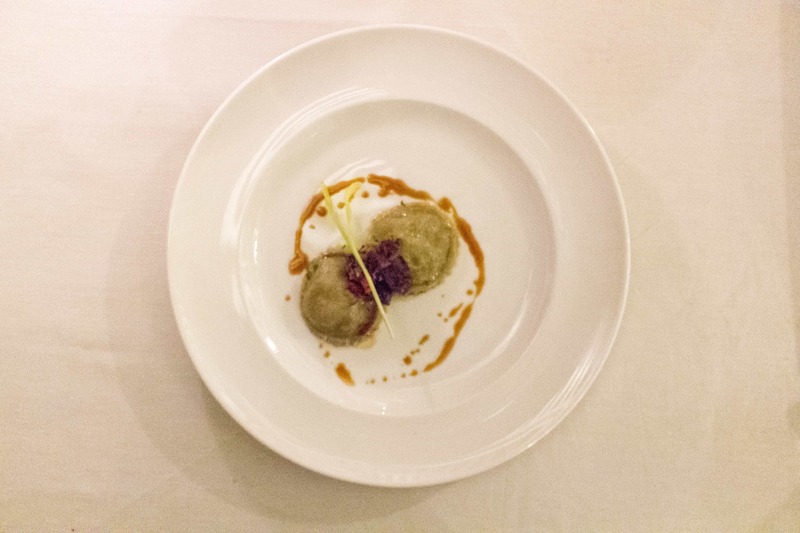 It was perfect – the pasta was the perfect thickness and gave the oxtail room to shine. At this point, we were given the choice to order our entrees but we were absolutely stuffed so we moved onto my favourite part: the dessert. There’s always room for dessert! Can we just talk about how pretty this is? The plating looks like a butterfly fluttering through! 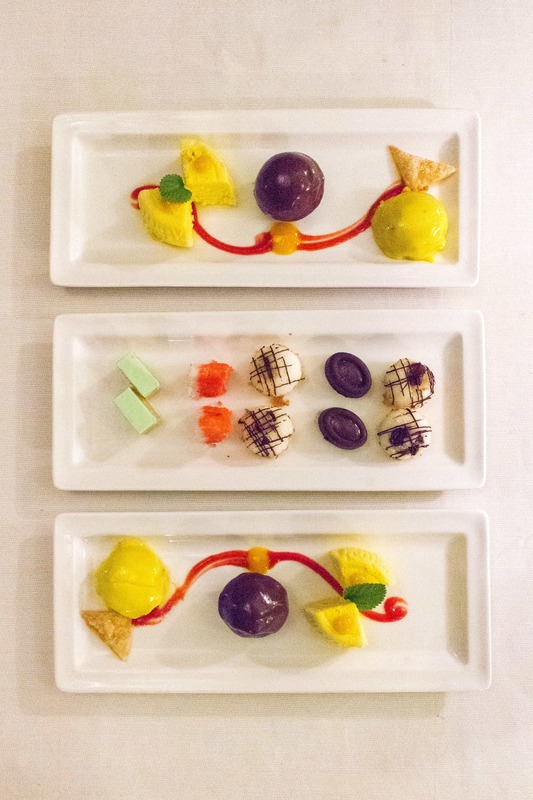 We had a banana dessert, Jamaican chocolate dessert, and a mango soffle, with raspberry sauce. The Jamaican chocolate story was so rich and creamy without being heavy and overwhelming. I think that was my favourite of the three. In addition to that, with had some smaller desserts to share (from left to right): pancake with buttercream, Jamaican grater coconut cake, raisin stuffed coconut macaroons, and a strawberry filled dark chocolate (and then the macaroons again). My table mates also had some coffee with their dessert and they were each brought their own individual french presses! We were all in awe when they came out with them! Overall, I loved Sugar Mill Restaurants. I loved seeing their twist on Jamaican flavours and how they elevated their dishes. In addition to that, their service was so attentive – they started pulling back my chair for me after every dish was served because they knew I was about to stand up and snap a photo with my phone. I would recommend that you make reservations if you get the chance. There is a shuttle bus at Half Moon Resorts that will bring you straight to the door if you’re staying at the resort. Given the chance, I’d love to go back because they had a duck breast pasta that I am now dying to try! For more on Jamaican food, check out this post from Bacon is Magic! Let’s Chat! Which of these dishes would have been your favourite? Will you be adding the Sugar Mill Restaurant to your list of stops in Jamaica? All of those dishes are so beautiful! I’ve only been to Jamaica once and it was on our honeymoon. We loved it! Wow, I haven’t tried any Jamaican food yet and I didn’t know that Jamaican people really love beef. Anyway, this beanery really serve a god food and I love how they stand out among the other usual food in Jamaica. It really looks so tempting and luscious. I as well love how you have captured the food. It really speaks a lot about its delectable innate state. I have never seen Jamaican food, but it looks and especially sounds amazing. I love that they have options for vegetarians and can accommodate allergies.Smoked pumpkin soup is right up my alley, for sure. The Sugar Mill Restaurant looks like the place to go for an authentic Jamaican food experience. I love the fact that the ingredients are locally sourced and the a lot of them are grown in their own gardens. It is such a nice feeling to eat dishes made from natural sources. Wow I really don’t know much about Jamaican like others have mentioned but it looks so good! The presentation at the Sugar mill restaurant is also pretty epic. Talk about food art! Powdered foie gras?! I hope that turned out as flavorfull as it should…on the fence with that one in particular. I love it how they made traditional food look so modern! I always love tasting traditional food. Thanks for these cute looking Jamaican foods. I havent tried any Jamaican food. All i could think about Jamaica are beautiful beach and blue ocean. I’ve never tasted Jamaican cuisine! I love the aroma of cintronella oil. Its just so mesmerizing! I love the presentation of food. The chill climate here right now and the pumpkin soup looks inviting. The dessert looks too yummy! I mentioned in the post that these were sampler sizes for us to get a taste of the menu without ordering everything in full size and not finishing it.